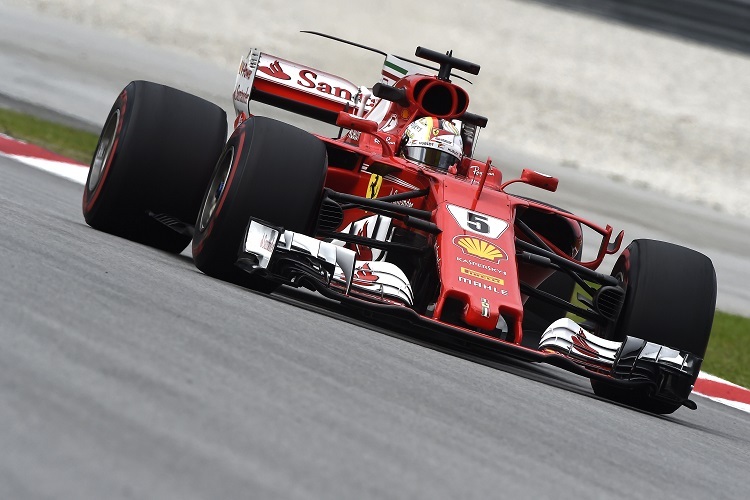 Scuderia Ferrari driver Sebastian Vettel topped the times in the second practice session of the weekend ahead of the final ever Malaysian Grand Prix; six tenths of a second clear of team-mate Kimi Raikkonen, as Ferrari came back with a vengeance in Sepang. 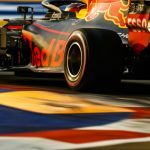 The German set a time of 1:31.261 to take the top spot on a set of the super-soft tyres, as Ferrari let rip, but the Mercedes AMG Petronas Formula One Team struggled to get anywhere near the Italian squad, or Red Bull Racing for that matter, who were the only team to get close to the prancing horse. Having experienced a wet first practice this morning, the free practice 2 session was a most welcome dry; with some sunshine even beginning to peer out from behind the clouds, but despite the better conditions Mercedes were way off the pace, and have plenty of head scratching to do ahead of the next session. The session was cut short following a red flag for Haas F1 Team driver Romain Grosjean, who crashed out with twenty minutes of the session remaining, following a dangerous incident involving an uplifted drain cover. 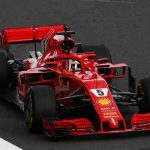 Vettel looked strong as he worked on making amends for the disappointing result in Singapore last time out, with Raikkonen keeping him company up at the top for a Ferrari one-two. The German looks to be on the right track so far this weekend, and it will now be down to whether he can keep his cool on race day. 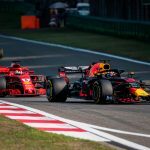 Red Bull Racing driver Daniel Ricciardo ended the session in third, two tenths of a second down on the Finn’s time, as the Milton Keynes based squad also looked racy here in Malaysia. Team-mate Max Verstappen was just one hundredth of a second further back, but did complain of understeer during the session. McLaren Honda Formula 1 Team driver Fernando Alonso was an extremely impressive fifth, and faster than both Mercedes drivers. Having finished third quickest in the free practice 1 session this morning as well, the Spaniard could be on for a strong performance on race day, as long as he can stay out of trouble at the start! Lewis Hamilton could only manage sixth, as Mercedes really struggled to get the W08 working. The Brit had a big off in the gravel at turn 7/8 early in the session, having sent himself into a spin when he clipped the first kerb and lost the rear of the car. He managed to dig himself out of the gravel and continue on his way, but that little adventure cost him track time, as the mechanics checked the car over. 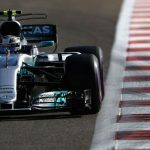 Team-mate Valtteri Bottas was seventh, and he too had an off-road excursion, in what was a far from easy start to the session for either Mercedes driver. The Finn had a huge moment coming out of turn 10, when he ran wide and got onto the kerbs trying to go by a much slower Williams FW40. The Finn did well to keep it out of the wall following a trip through the gravel, but it was a bizarre move from the Mercedes driver, as there was plenty of space available to make the manoeuvre. Sahara Force India F1 Team driver Sergio Perez was next up in eighth, just two tenths off the pace of the Mercedes, with Renault Sport Formula 1 Team driver Nico Hulkenberg in ninth, and Esteban Ocon completing the top ten. Jolyon Palmer was eleventh, four tenths off the pace of his team-mate, with Williams Martini Racing driver Felipe Massa in twelfth. Williams had hoped to be much stronger here in Malaysia this weekend, but so far, that does not appear to be working out for them. Stoffel Vandoorne was thirteenth, and more than a second off the pace of team-mate Alonso, with Lance Stroll in fourteenth. The Canadian was experiencing the Sepang International Circuit for the first time this weekend, and got himself into a spot of bother as he took out a bollard when running wide onto the gravel. New Scuderia Toro Rosso driver Pierre Gasly, who has replaced Daniil Kvyat at the Faenza based squad this weekend, was fifteenth. The Frenchman did a fantastic job in the tricky wet conditions this morning, and put in another solid performance in free practice 2, to emerge faster than team-mate Carlos Sainz Jr. by one tenth of a second. The Spaniard struggled with the STR12 during this free practice 2 session however, reporting over team radio that the car was undriveable, giving him so much oversteer “like a handbrake”, as he ran wide and into the gravel at turn 11. He also later reported having no power on the straights. Grosjean ended the session down in seventeenth place, following his massive shunt late in free practice 2. The Frenchman went off at high speed and hit the barriers hard, as his right rear tyre became completely shredded, after hitting a protruding drain cover that had been flipped up by Bottas just moments earlier. The Haas driver was thankfully unhurt from the incident, but the VF17 suffered extensive damage and the session was red flagged before being stopped completely. The Frenchman did however still manage to finish ahead of team-mate Kevin Magnussen, who was complaining of understeer, as was Grosjean, throughout the session. Like clockwork, Sauber F1 Team drivers Pascal Wehrlein and Marcus Ericsson finished in nineteenth and twentieth place respectively, at the bottom of the order. 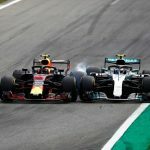 So, Ferrari look to have the edge from Red Bull so far this weekend, with both Mercedes driver struggling with the W08 in the Malaysian heat, reporting a lack of grip as their main issue out there today. 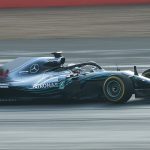 The Silver Arrows were a surprising 1.4 seconds off the pace, and have plenty of work ahead of them to catch their rivals.